A guide to the practice of stem cell transplantation, its status in the treatment of various disorders and the problems that arise after transplantation, aimed at the whole transplant team. An up to date guide to best practice in the use of stem cell transplantation, covering current status in the treatment of malignant and non-malignant conditions, practical aspects and problems such as infection and graft versus host disease. Has a practical, accessible approach with free use of algorithms, list tables. Aimed at the whole transplant team - this is an interdisciplinary field. International contributor team with editors in the UK and USA. PART 3. PREPARATION FOR TRANSPLANT Patient selection: preliminary interview, screening of apient and donor. Stem cell donor registries. Cord blood banks and umbilical cord blood transplantation in children and adults. Human leukocyte antigen matching, compatibility testing and donor selection. 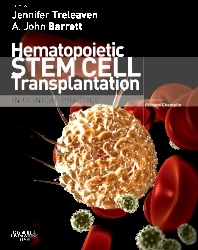 Collection and processing of marrow and blood hematopoietic stem cells. Vascular access. High-dose regimens for autologous stem cell transplantation. Myeloablative conditioning regimens for allogeneic transplantation. Reduced-intensity conditioning for allogeneic hematopoietic stem cell transplantation. Transplants from unrelated or mismatched family donors. Management of the older patient. PART 4. POST-TRANSPLANT CARE Transfusion medicine support for hematopoietic stem cell transplantation. The transplant pharmacopoeia. Nutrition support. Barrier precautions, prophylaxis and neutropenic fever. Re-immunization after hematopoietic stem cell transplantation. Psychological and supportive care issues in the transplant setting. PART 5. MANAGEMENT OF POST-TRANSPLANT COMPLICATIONS Graft failure. Acute graft-versus-host disease. Chronic graft-versus-host disease. Management of relapse and minimal residual disease after stem cell allografting. Bacterial infections. Viral infections. Fungal infections. Parasitic infections. Multiple organ failure and intensive care. Late effects. PART 6. THE WIDER PERSPECTIVE Starting a hemopoietic stem cell transplant unit. Ethical and legal considerations in stem cell transplantation. How to build and use a stem cell transplant database. Blood and marrow transplant organizations. Stem cell transplantation - future prospects.